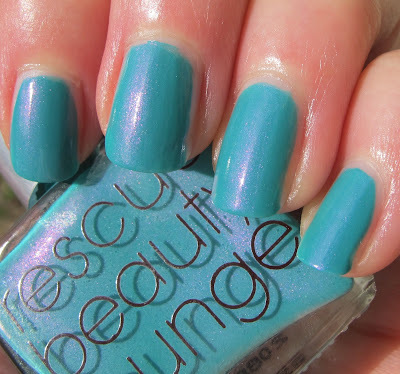 Never Enough Nails: Rescue Beauty Lounge Aqua Lily Needs an Armed Guard! Rescue Beauty Lounge Aqua Lily Needs an Armed Guard! I delayed in posting this gorgeous polish, Rescue Beauty Lounge Aqua Lily, because of it's sold out status. However, Ji Baek has since announced that Aqua Lily will be in the next Bring It Back collection!!! Woo hooooo!! She probably decided to include this polish in the next Bring It Back collection because this is the kind of polish that people try to steal from you. When your friends and family (*ahem* Mom!) see this on your nails, they immediately want to "borrow" it. And you may never see it again!! Aqua Lily is a unique turquoise polish with RBL's famous "hidden shimmer". The hidden shimmer is a stunning pinky purple color!! The shimmer wasn't hidden that often here, as you can see from the pictures. I could even see it in my boyfriend's not so brightly lit basement, so I'd say it's pretty nicely visible. I prefer visible shimmer, so this means that I LOVE THIS POLISH!! Turquoise plus pink shimmer? YES!! This is three coats of Aqua Lily, but you could definitely do two if you weren't planning on photographing it with a macro lens! The formula was great and so easy to control! I will be needing a security guard for this polish to prevent my friends from walking off with it. 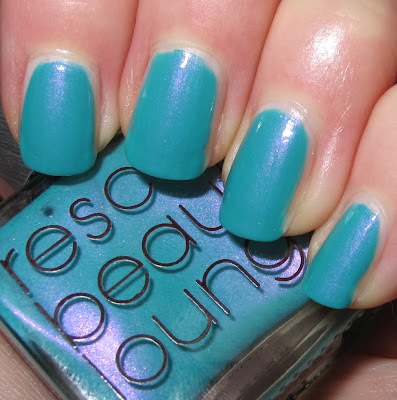 Rescue Beauty Lounge Aqua Lily should be available again later this year. Definitely sign up to be a V.I.P. and be notified of their pre-sales. Their polishes are very easy to obtain as long as you pre-sale them. Once the regular sale starts, all bets are off and things sell out fast! Have you seen the latest collection, by the way? It's based on Georgia O'Keeffe's art and I NEED Jack in the Pulpit!! Ji said she needs a new photographer to take the pictures that they use on the website before this collection can be sold... you know, Ji, my boyfriend is a professional photographer!! (do you think I'd get free samples if he took their pictures??? How about I make him work for polish?! LOL). i am only partially joking. Sign up to be an RBL V.I.P. to find out when Aqua Lily will be sold again! The shimmer in this is so gorgeous! Agreed!! It's a really beautiful pinky purple color, and I love that I could even see it in bad lighting! You're swatches of Aqua Lily really show the shimmer nicely! When I was creating it with Ji, I referred to it as the "turquoise/fuchsia fusion" before naming it ;) hope your friends don't try to take your bottle! Just tell 'em to get their own when AL comes back in Nov :) Thanks for the lovely review... enjoy!